Which Languages Have Withstood the Test of Time? No one is certain when language began, but we do know that it originated long before ancient times. If you’re a native English speaker, you know that English, like many other languages, went through discernable periods: various forms of Old English, early Modern, and now, Modern English for example. And anyone who’s tried to read something from Old English understands how different it is. However, there exists the core of that language through time. Meaning that even though we may struggle with it, we can still read through bits and pieces. This is because language is organic, and it changes over time. As it moves with people to new areas, it builds characteristics and sometimes becomes a dialect of its language or changes into a daughter language, creating a uniquely different system with traits of its former self. This is important to know because labeling the age of a language is hard. You have to ask, when does a language stop being what it was before and start living as it is now? For some of the languages on this list, that’s easier than others. Some have remained the same or similar through time, while others have made noticeable changes. Either way, they are still the same language. Here is a list of the oldest living languages still used in the world today. Spoken by over 6 million people, many of which live in Armenia, Russia, and Georgia, this language has additional scatterings of speakers through the world. Once mistaken as a dialect of Iranian, it is its own branch of the Indo-European Language family. Additionally, its oldest text is a 5th-century translation of the bible. Said to have originated around the 4th century A.D., this language has a dwindling number of native speakers centralized in Ireland. It houses the oldest vernacular literature of any Western European languages. And is used side-by-side of English throughout the Republic of Ireland as the recognized official language. Georgian is the official language of Georgia. It is one of the three languages that comprise the Southern Caucasian family. Its alphabet consists of 33 letters, none of which have capital letters and consonants are used often. 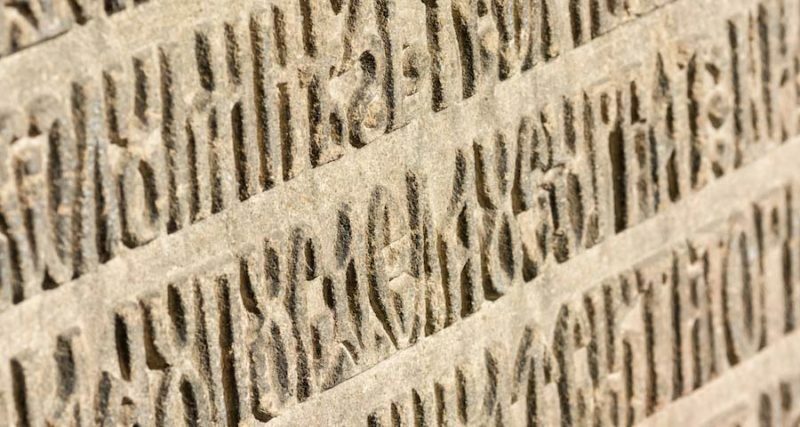 Written inscriptions have been found from the 5th century, and the written form of the language looks vastly different than Western languages. Hebrew has an unsettling history, nearly becoming extinct at one point in Late Antiquity. It managed to survive as a liturgical language through the middle ages until it’s 19th-century revival. After successful restoration efforts, nearly 9 million people speak Hebrew today. The majority of its population rests in Israel, where it is recognized as the national language. Hebrew has perhaps the strongest recognition for being the original language of the Old Testament. And its influence concerning religious influence shows in English today with many names like Abraham and Jacob along with words like “satanic” and “kosher” prominent in the language. One other characteristic about the language is that it is written right to left, while numbers are written left to write. This ancient language is synonymous with biblical times and has origins dating back between 800 and 1100 B.C. Found in the cradle of civilization, Aramaic was the lingua franca of merchants and was once the dominant language in the middle east. Today, there are less than a million speakers throughout areas like Iraq, Turkey, Iran, and Armenia. It’s currently in danger of becoming extinct. The Chinese language has perhaps the oldest written form of a language in the world going back almost 6,000 years. There are variations of the Chinese language, many of which are still spoken till this day. The most popular being Mandarin and Cantonese. But there are many more, over 130 different dialects spread throughout the country. Recently, the study of Chinese has blossomed in popularity as China’s economy continues to grow expands their trade. Chinese is also an official language of the UN. Greek has a rich history, spread during the high point of its empire. This language goes all the way back to over 1100 B.C., interacting with many languages along the way. Compared to Latin, it is one of the most historically influential languages in the Western world. Present day, it is spoken by over 11 million Greeks and is a recognized language of the UN. Arabic dates back to roughly 500 B.C. and has over 400 million speakers to date. This language spread throughout the Middle East and up into parts of Europe where it influenced Spanish and other languages. It was historically the language of science and mathematics. For example, Algebra, come from the Arabic meaning, “the reunion of broken parts.” Also, the word “al” means “the” in Arabic, so when you see words with the prefix “al” chances are that it’s from Arabic. Today, the language is still going strong with nearly 30 countries recognizing it as their official language. It is also the language of the UN. A derivative of the Dravidian language with origins around 500 B.C. It’s the official language of Singapore and Sri Lanka, but parts of India and Malaysia use Tamil as well, bringing the total number of speakers to 70 million people worldwide. Because of its age, it is one of the oldest living languages in the world. In fact, it’s so old that it’s viewed as a living “classical language” by UNESCO. A classic favorite, the origins of Latin date to roughly the 7th century B.C. with Latin-speaking people around the Tiber River. The power of the Roman military spread this language throughout much Europe until its collapse in the 5th century. Since then, it transitioned to a language used for the literate and for scholars. It also serves as the language of the Catholic Church. It’s still studied this day, as an understanding of the Latin language helps provide a better understanding of other languages and professions build off of the language. Today, it’s classified as a dead language. These are only a few of the oldest languages still thriving in the world today. Not only are they still in use, but many people who speak them could easily read texts from hundreds of years ago as several of them have remained unchanged. And if you wanted to, you could start a language learning program in any one of them, working your way to fluency. However, if you’re interested in studying Spanish or you were curious about how to study Russian or any other popular language, then you should check out language learning with Optilingo. There you can find out how to learn Russian grammar and other languages that will help give you an advantage in an increasingly globalized world. It’s a simple, effective program designed to help you reach fluent fast using brain-based techniques that work.